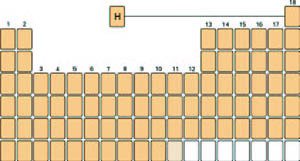 The proposed format of the periodic table, with hydrogen at its head in Period 1 but assigned to no group. But rather than considering the relative virtues of these three possible placements, I intend to consider the argument for the removal of hydrogen from the main body of the table a little more closely and from the perspective of the philosophy of chemistry. A very widely held belief, among chemists and others alike, is that the periodic system consists primarily of a classification of the elements as simple substances that can be isolated and whose properties can be examined experimentally. However, there is a long-standing tradition of also regarding the elements as unobservable bearers of properties, sometimes termed elements as basic substances. Surprising as it may seem, this notion has had a profound influence on the establishment and the survival of the periodic system since its discovery in the 1860s. For example, Mendeleev, arguably the leading discoverer of the periodic system, frequently stressed that he was primarily classifying the elements in the sense of abstract bearers of properties and not as simple substances. Whereas carbon occurs as graphite and diamond, if one focuses on the element in its simple substance forms, the entry for carbon in the periodic table refers to the element as the basic substance which underlies both allotropic forms. Our current inability to place hydrogen in the periodic table in an unambiguous manner should not lead us to exclude it from the periodic law altogether, as Atkins and Kaesz seem to imply in removing hydrogen from the main body of the table. I suggest that hydrogen is as subject to the periodic law as all the other elements are. I also maintain that there is a “fact of the matter” as to the optimum placement of hydrogen in the main body of the table and that this is not a matter of utility or convention that can be legislated as these and other authors have argued. Rather than relying on specific properties of the elements as simple substances, we should seek some form of underlying regularity in order to settle the question of the placement of hydrogen. One possibility is to begin each new period with a new value of n + l (sum of first two quantum numbers) in the assignment of electronic configurations, as many authors have suggested.3 Such a periodic table results in the placement of hydrogen in the alkali metals and helium among the alkaline earths. Of course the second of these placements raises further difficulties for those who insist on viewing the elements only as simple substances. But as I have tried to argue here this is a mistaken view of the nature of the chemical elements. 1. M. W. Cronyn, J. Chem. Educ., 2003, 80, 947–951. 2. E. R. Scerri, in Minds and Molecules, N. Bhushan, S. Rosenfeld (eds. ), Oxford University Press, New York, 2000. 3. G. Katz, The Chemical Educator, 2001, 6, 324–332. Eric Scerri <scerri@chem.ucla.edu>, Department of Chemistry and Biochemistry, University of California in Los Angeles, CA, USA. I support your suggestion for the new central position for hydrogen. It is a good and reasonable solution to the problems you discuss. To take away H from the head of the alkaline metals group and put it in the center is an excellent idea and should be adopted by IUPAC. I do agree with you that an adaptation in which hydrogen is centered at the head of the periodic table has great merit. You have sound arguments for such a proposition. —Primož Šegedin <primoz.segedin@Uni-Lj.si>, Department of Chemistry and Chemical Technology, University of Ljubljana, Slovenia. Page last modified 17 May 2004.